TORONTO CATHOLIC WITNESS: BOMBSHELL: Archbishop Henryk Hoser: "some bishops.... do not even accept the official teachings of the Church"
BOMBSHELL: Archbishop Henryk Hoser: "some bishops.... do not even accept the official teachings of the Church"
Polish Archbishop, Henryk Hoser of Warszawa-Praga has spoken this past February of the massive, near universal failure of churchmen, of clergy in general, to preach and teach the truth of Humanae Vitae. 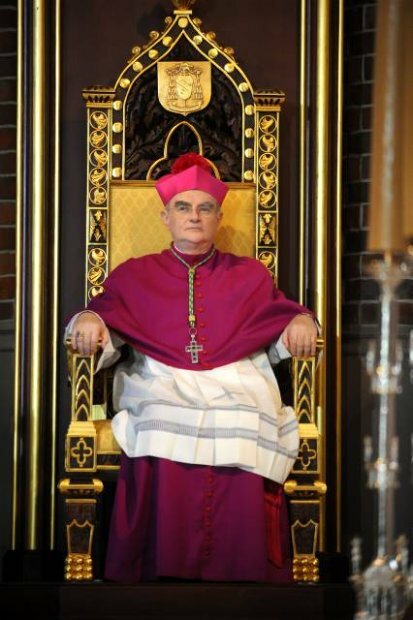 Archbishop Hoser has even spoken of the "betrayal" of the recently sainted Pope John Paul II. Ask yourself: when was the last time you heard a priest speak about the evil of contraception? Or of homosexuality? Or of adultery or fornication? How many Catholics were horrified that rather than call these evils what they are, there were priests, bishops and even Cardinals who were asking that sins no longer called sins at the recent Synod. Yet there still were bishops who courageously followed Our Lord, defending the Sixth Commandment against the heretical innovators who were busy proposing a Christological heresy; changing doctrine through the change of pastoral practice. One such bishop who opposed these evils was Archbishop Hoser. God drew good out of evil, for not only did we see a marvelous manifestation of Catholic truth from Africa, Poland, Estonia, Boliva, The famous "Thirteen" (including Toronto's Thomas Cardinal Collins) etc., we also saw the forces of evil overplay their narcissistic hand: we saw the depth of the corruption of the adulterists and homosexualists. One friend suggested to me today: the Synod was good for it exposed to the Church how many homosexuals are amongst the bishops. Toronto Catholic Witness provides a complete translation of the section that pertains to the vexing and ongoing push by adulterists to inject the poison of heresy into the Church by throwing out the sixth Commandment, and profaning the Most Holy Eucharist. Question: On the other hand, one may well wonder that if the teachings had been transmitted with work at the pastoral level with families, it would not have got to the point where they would take it upon themselves - as in Germany - to put forward demands for Communion for the divorced? Archbishop Hoser: Not following the voice of the Church always leads to undesirable situations. Yet it is hard to convince some bishops, for some are so determined to introduce innovations, that they do not even accept the the official teachings of the Church. They are very susceptible to any ideology, probably the effect of the philosophy of idealism. Question: Didn't bishops from wealthy countries try to impose their ideas on the rest of the world? Many more families are suffering from poverty or war, meanwhile, for them, Holy Communion for divorced was always the central topic - at least in the media - while much more painful problems were regarded as of less importance? Archbishop Hoser: We are seeing today the expansion across the whole world of the decadent culture of the West, likewise marriage and family life is feeling the effects of this globalization. This decadence threatens other continents, where its effect can be even more brutal. The Synod participants from African countries spoke of the imposition of contraception and abortion according to the Maputo Protocol and the dependence on the implementation of economic support for requests and projects based on the demands of international organizations. To realize these plans the older generations role is to be marginalized, for parents are the biggest "brake" in the implementation of these cultural projects. The Synodal Sessions were attended by Teresa Roman Nyirabukeye from Rwanda, who was my assistant for twenty years. She spoke of the creation of special clubs where children were taught to oppose their parents. Yet, of course, numerous initiatives have arisen based on the foundation of the Christian vision of the person. The John Paul II Pontifical Institute for Studies on Marriage and Family at the Catholic University of America in Washington, DC. Similar institutions, likewise, exist in Benin and also in Kenya,in Nairobi. The French have undertaken many initiatives, with a strong theological foundation, that one can look to. The most difficult thing, and contrary to the spirit of the world, is to give a reminder of what is not spoken of - for it is very difficult for the people of today to accept - that life is the carrying of the cross. It is a "breath of fresh spiritual air" to read and see reports like yours affording us a chance to see the TRUTH. To some of us these kind of revelations are practically hidden.Please accept my gracious thanks for this article and may you continue in bringing to us such reports,thanks,God bless us all,amen. Great article. We, the Faithful Catholics, still have some Arch-Bishops who follow Our Lord and Saviour, Jesus Christ. Sadly, many in Rome who wish a 'worldly, smooth,inclusive,non repentant church will not heed this Warning:"But whoever denies Me before men, I will also deny him before My Father in heaven.Matt 10:33.